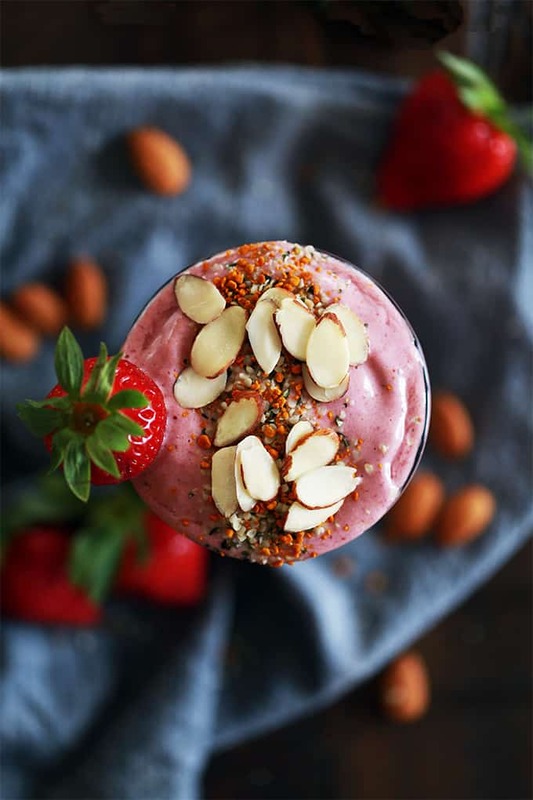 This four ingredient Strawberry Almond Smoothie takes just five minutes or less to prepare. Frozen strawberries, Greek yogurt, almond milk and almond butter whirl together to create this smooth and luxurious treat that’s not only perfect for breakfast but also for lunch or a post-workout treat. So this is what I’ve had for breakfast nearly every day for the past four months. Like clockwork, as soon as I get the menagerie their breakfast and finish packing everyone’s lunches and snacks, out comes the blender and the needed ingredients from the freezer and fridge for my Strawberry Almond Smoothie. It’s just the stage of life I’m in right now. Mama doesn’t have time to eat breakfast, so instead I drink it as I drive everyone to school. It’s healthy and keeps me full until lunch, so no complaints here! 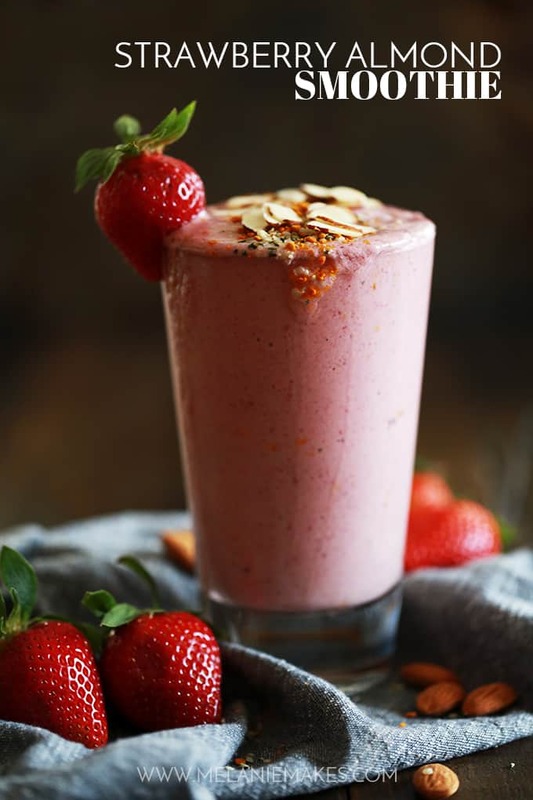 This four ingredient Strawberry Almond Smoothie takes just five minutes or less to prepare. It depends on how many times I need to stop to fix someone’s hair, find a lost library book or sign a last minute reading log. 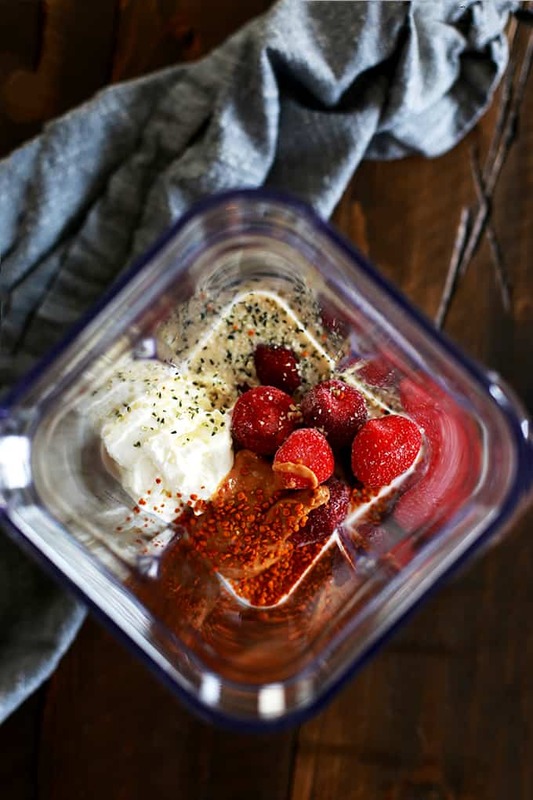 Frozen strawberries, Greek yogurt, almond milk and almond butter whirl together to create this smooth and luxurious treat that’s not only perfect for breakfast but also for lunch or a post-workout treat. Or let’s face it, when I’m lazy and don’t feel like making anything to eat. 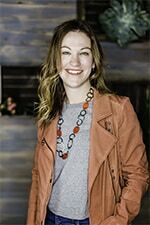 If I really want to switch things up for another meal, I’ll substitute my Strawberry Grapefruit Smoothie, a Raspberry Peanut Butter Smoothie or my children’s favorite, a Chocolate Covered Strawberry Pudding Smoothie. My fridge and freezer are always stocked with the necessary ingredients for this smoothie but I also tend to add a few extras as well. I feel like a true healthnut Coloradan when I add a teaspoon of bee pollen, two scoops of collagen peptides, a tablespoon of hemp hearts and a big handful of frozen spinach or kale. Granted, when you add the spinach you lose the gorgeous pink hue and instead you get a brown-ish color smoothie, but you don’t taste it whatsoever. My trick is to drink it in a colored tumbler so I don’t even notice anymore. I like to think that the bee pollen helps to keep me healthier and the collagen peptides are supposed to make my hair and nails silky and strong. 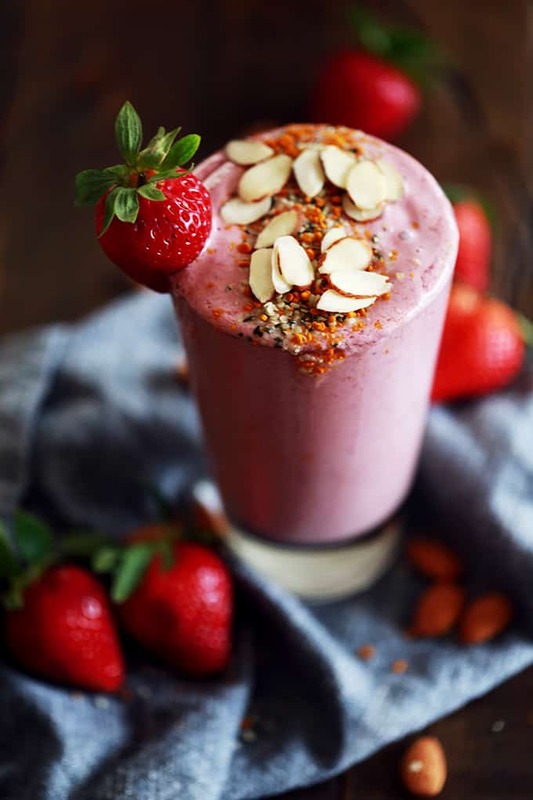 They, along with the hemp hearts, also add a big boost of belly filling protein to this Strawberry Almond Smoothie. 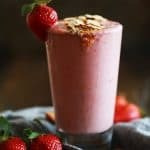 When drinking this Strawberry Almond Smoothie at home, I love adding some garnish to the top to make it feel a bit more special than just a typical smoothie. I simply sprinkle on some additional bee pollen and hemp hearts as well as some sliced almonds. Just a bit of crunch! Four months of this smoothie and I’m still going strong – I’m going to ride this easy breakfast train as long as possible. In a blender carafe, add all ingredients. Looking to get creative? I also like to add a frozen spinach or kale, bee pollen, collagen peptides and hemp seeds to my smoothie. Smoothie fans will also no doubt enjoy this Peanut Butter Banana Smoothie with Spinach, Berry Turmeric Smoothie and Cranberry Smoothie Bowl. What a great way to tell my daughter this is dessert! It'll be gone in the blink of an eye! I need this for breakfast! A fun way to treat myself. This would be perfect for breakfast or an afternoon snack to sip on. Smoothies are so much fun! This one looks delish! Such a gorgeous smoothie!! The perfect breakfast treat!! My favorite flavor! Craving for this smoothie! Great looking smoothie! Love the strawberry color. I bet the real deal is very delicious because those pictures are so luscious. Can't wait to try this one. I want this for breakfast, lunch, and afternoon snack! YUM! This gorgeous smoothie is just right for sending with my kids on their way out the door! Yes - on busy mornings I love doing the same, Amy! The almond butter is such a great idea!! What a STUNNING smoothie! I have a strawberry-spinach smoothie most mornings, but the idea of adding almond is just tantalizing. Can't wait to give it a go! Thanks so much, Michelle - it's definitely my go-to breakfast these days! This is a perfect way to use up all those in season strawberries! My freezer is always stocked so that I can make them anytime!